Figure A. Alexa Fluor 647 conjugated Mouse anti Rat CD4 ( MCA153A647 ) and RPE conjugated Mouse IgG2a isotype control ( MCA1210PE ). Figure B. Alexa Fluor647 conjugated Mouse anti Rat CD4 ( MCA153A647 ) and RPE conjugated Mouse anti Rat CD44 ( MCA643PE ). All experiments performed on red cell lysed rat blood gated on mononuclear cells. 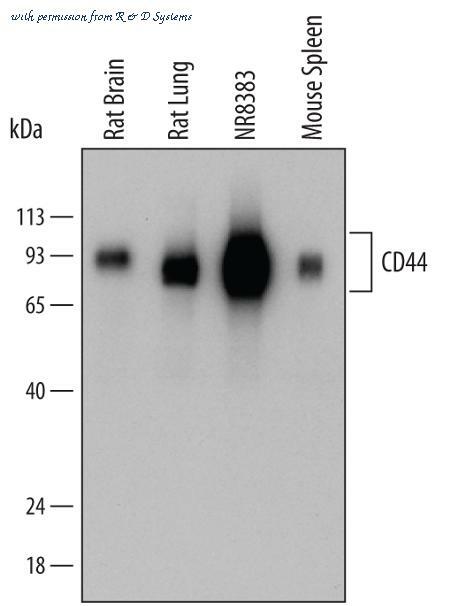 Detection of Mouse and Rat CD44 by Western Blot. Western blot shows lysates of RAW 264.7 mouse monocyte/macrophage cell line, mouse spleen tissue, mouse lymph node tissue, and rat brain tissue. PVDF membrane was probed with 1 ╡g/mL of Sheep Anti-Mouse/Rat/Porcine/Equine CD44 Antigen Affinity-purified Polyclonal Antibody (Catalog # AF6127) followed by HRP-conjugated Anti-Sheep IgG Secondary Antibody (Catalog # HAF016 ). Specific bands were detected for CD44 at approximately 80 to 100 kDa (as indicated). This experiment was conducted under reducing conditions and using Immunoblot Buffer Group 1 . 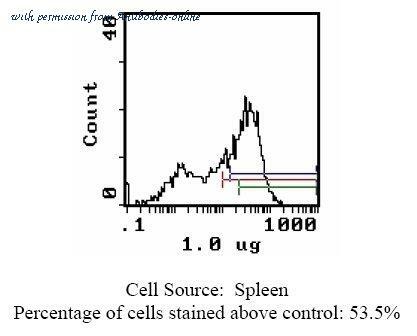 Detection of CD44 in Rat Splenocytes by Flow Cytometry. Rat splenocytes were stained with Mouse Anti-Rat CD4 APC-conjugated Monoclonal Antibody and either (A) Mouse Anti-Rat CD44 Alexa Fluor« 488-conjugated Monoclonal Antibody (Catalog # FAB6577G) or (B) Mouse IgG2B Alexa Fluor 488 Isotype Control (Catalog # IC0041G ). View our protocol for Staining Membrane-associated Proteins . 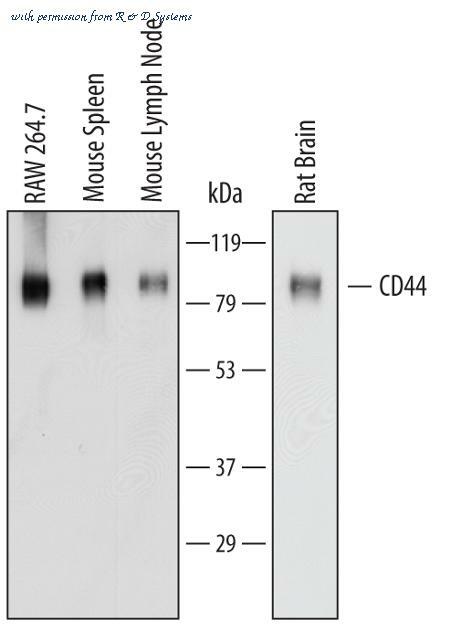 Detection of Mouse and Rat CD44 by Western Blot. Western blot shows lysates of rat brain tissue, rat lung tissue, NR8383 rat alveolar macrophage cell line, and mouse spleen tissue. 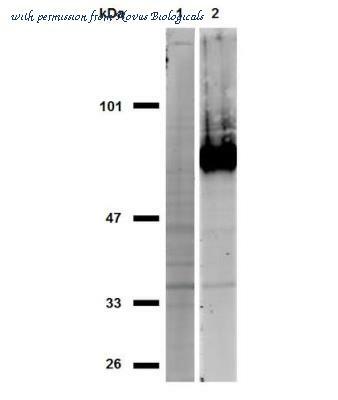 PVDF membrane was probed with 0.1 ╡g/mL of Sheep Anti-Rat CD44 Antigen Affinity-purified Polyclonal Antibody (Catalog # AF6577) followed by HRP-conjugated Anti-Sheep IgG Secondary Antibody (Catalog # HAF016 ). 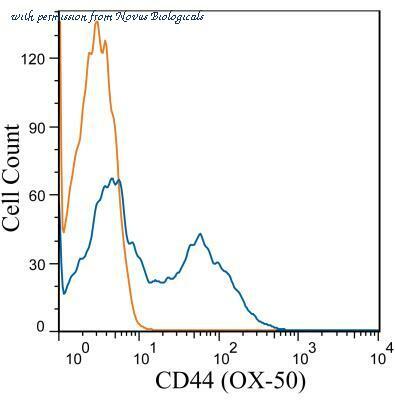 Specific bands were detected for CD44 at approximately 80-100 kDa (as indicated). This experiment was conducted under reducing conditions and using Immunoblot Buffer Group 1 . Immunofluorescence analysis of human lung carcinoma tissue using CD44 antibody. 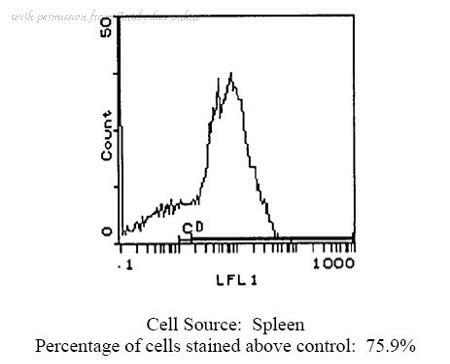 Flow cytometric analysis of Mouse spleen cell using CD44 antibody. 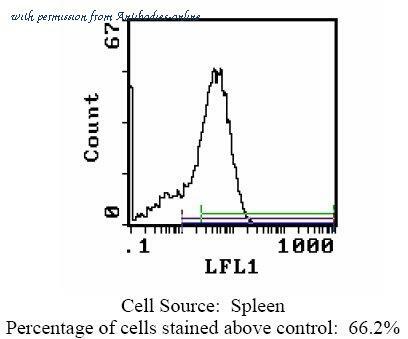 Western blot analysis of extracts from spleen cell using CD44 antibody. Immunohistochemistry-Paraffin: CD44 Antibody (OX-50) [NB600-1317] - IHC analysis of a formalin fixed and paraffin embedded tissue section of Rat small intestine using Mouse anti-Rat CD44 antibody (clone OX50) at 1:100 dilution. The staining was detected using HRP-conjugated anti-Mouse secondary antibody with DAB reagent followed by hematoxylin counterstaining. This antibody clone specifically stained the membranes of the cells close to the bases of the crypts/villi which are known to actively migrate towards the tip of villi. Flow Cytometry: CD44 Antibody (OX-50) [NB600-1317] - Rat Splenocytes were stained with CD44 (OX-50) antibody NB600-1317(blue) and a matched isotype control NBP2-27287 (orange). Cells were incubated in an antibody dilution of 1 ug/mL for 20 minutes at room temperature. Both antibodies were conjugated to Alexa Fluor 488. 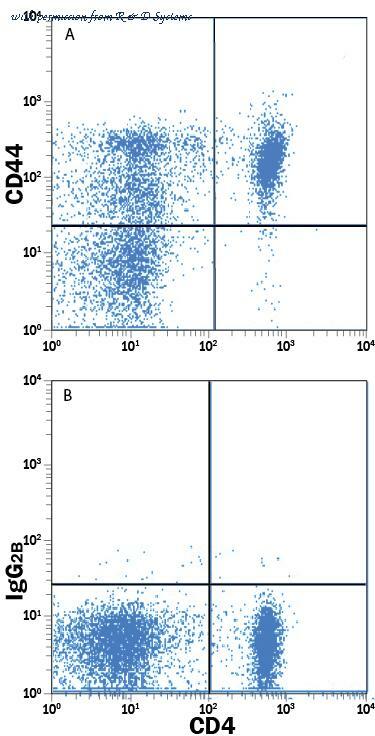 Flow Cytometry: CD44 Antibody (OX-50) [NB600-1317] - Analysis using the FITC conjugate of NB600-1317. Staining of rat spleen cells with Mouse anti Rat CD44: FITC. Western Blot: CD44 Antibody (IM7) [NBP1-41266] - Analysis of CD44 in HeLa cells (positive; lane 2) and MOLT-4 cells (negative; lane 1) using anti-CD44 (IM7) purified; non-reducing conditions. Immunocytochemistry/Immunofluorescence: CD44 Antibody (1M7.8.1) [NBP2-22436] - Analysis of CD44 (green) showing staining in the membrane of BAF-3 cells (right) compared to a negative control without primary antibody (left). 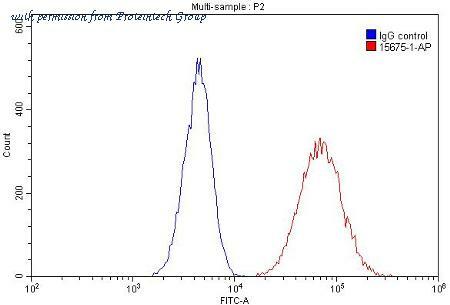 The CD44 antibody from Proteintech is a rabbit polyclonal antibody to a recombinant protein of human CD44. This antibody recognizes human, mouse antigen. 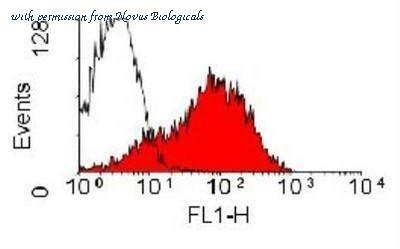 The CD44 antibody has been validated for the following applications: ELISA, FC, IHC, WB, IF, IP analysis.